Fred Guttenberg, whose 14-year-old daughter Jaime was killed last week in the Parkland school shooting, emotionally confronted Sen. Marco Rubio of Florida, calling his and President Trump's response "pathetically weak." His comments at the CNN Town Hall Wednesday received loud cheers from the audience. "You and I are now eye-to-eye because I want to like you," Guttenberg said. "Look at me and tell me -- guns are the factor in the hunting of our kids in our school this week -- look at me and tell me you accept it and you will work with us to do something about guns." Jaime Guttenberg was one of the 17 people killed last week at Marjory Stoneman Douglas High School in Parkland, Florida. Since the shooting, students from the high school have rallied at the Tallahassee Capitol while pushing for more gun control. Rubio appeared Wednesday with two Florida Democrats, U.S. Rep. Ted Deutch and Sen. Bill Nelson. Both Deutch and Nelson said they would support a ban on assault weapons. Rubio said he supports raising the age limit for purchasing AR-15-style weapons. "I absolutely believe that in this country, if you are 18 years of age you should not be able to buy a rifle," Rubio said. "I will support a law that takes that right away." Rubio said he is "reconsidering" his position on high-capacity clip magazines "because while it may not prevent an attack, it may save lives in an attack. And I'll let the authorities discuss at the appropriate time why I say that. But suffice it to say, I believe that there will be evidence that at a key moment in this incident three or four people, three or four people might be alive today because of something that this deranged killer did, had to do." A Marjory Stoneman Douglas High School student challenged Rubio to say if he would accept donations from the National Rifle Association in the future, and Rubio wouldn't say no. Rubio said "once you look at how easy it is to get around the loopholes, you'd literally have to start banning every automatic weapon," which received loud cheers from the audience. A Marjory Stoneman Douglas High School teacher said "teachers are not trained in marksmanship." All three politicians said they did not support arming teachers, including Rubio. The position clashes with a suggestion Mr. Trump made earlier Wednesday. In one of the more emotional exchanges, Marjory Stoneman Douglas High School senior Ryan Deitsch asked "why do we have to be the ones to do this? Why do we have to speak out to the Capitol? Why do we have to march on Washington?" NRA spokeswoman Dana Loesch also appeared at the event, and told the students her organization is standing up for them. Broward County Sheriff Scott Israel responded "you just told these kids you're standing up for them. You're not standing up for them until you say 'I want less weapons.'" According to CBS Miami, before the event, Israel told the crowd "my generation, we did not get it done. You will get it done." 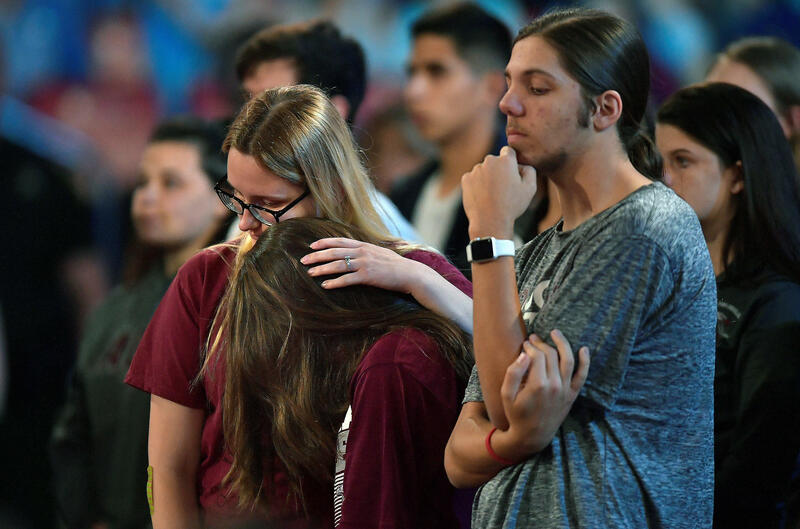 Broward County school superintendent Robert Runcie told the Stoneman Douglas community that they have started a movement. Earlier Wednesday, Mr. Trump held a listening session with survivors of gun violence. In addition to arming teachers, Mr. Trump reiterated that his administration is going to push "very strong background checks" and increase its focus on mental health. The president appeared frustrated over a seeming lack of a venue for dealing with people who exhibit warning signs, saying there once were mental institutions.